Smaller, hand-knotted wool rugs can be cleaned by hand using gentle liquid soap and cool water. Vinegar and water are also effective cleaners. A hand-knotted wool [rug](https://society6com/rugs?utm_source=SFGHG&utm_medium=referral&utm_campaign=8775) is a work of art -- a testament to the individual who crafted it. It's one-of-a-kind, and, as such, it should be treated accordingly. Oriental rugs are the hand-knotted woolen rugs that you see most often. The natural oils in the wool repel stains; the colors don't run; and the rug should be hand-washed. However, wool rugs are heavy. A room-sized rug should be professionally washed every few years, depending on the amount of traffic it's experienced. A smaller, hand-knotted wool rug can be hand-cleaned and its nap returned to the shine it displayed when brand new. Test the cleanliness of your rug by lifting a corner of it off the floor, bending it and **examining the base** of the fibers. If you see dirt, it's time to clean it. Another method is to rub over the surface of the rug with a damp, clean white cloth. If dirt transfers, it's time to clean it. If the rug is small enough, **shake** out the **ground-in dirt** A vacuum will remove most of the dirt as well, but before you use it, turn off the rotary beater. [Vacuum with the nap](http://bashianrugcom/care-and-maintenance/) and be careful not to tangle the fringe in the machine. Turn the rug over and **vacuum** the **bottom** to catch residual dirt and grit. To completely wash a hand-knotted wool rug, take it outside and put in on the driveway or patio. Thoroughly wet the rug with a **hose** and **cool water**, and hand-rub gentle wool cleaner into the nap. Using a large, soft sponge, scrub lightly in a **linear motion**, always going in the **direction of the nap**. Rinse thoroughly with the hose; then move the rug to a dry spot, preferably in the sun. A rotating fan helps the wool dry. If the rug is small enough, spread it over a slatted lounge chair to air out the underside. When the top has dried, turn it over to dry the back. Vacuum again to restore the nap. **Water** is one of the best cleansing agents for a wool rug. A wet, color-safe cloth run over the nap should remove surface stains. **Club soda** is another safe spot remover; the bubbles lift and help remove a stain. Always blot the excess fluid from the rug. A light-duty machine also cleans the rug, but don't use a soapy solution. Mix 1/4 cup of distilled vinegar with a gallon of water to clean the rug, always cleaning in the direction of the nap. 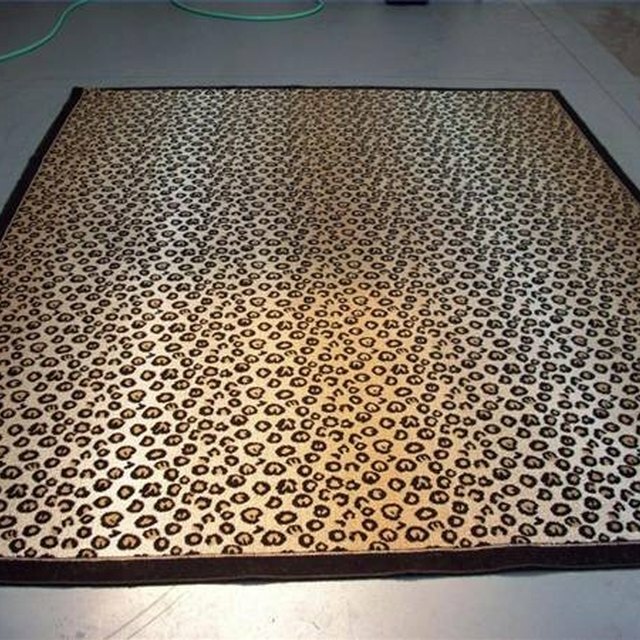 If the rug is on a wood or laminated floor, **put plastic underneath** the rug to protect the flooring. Dry the rug by propping it up from the underside and allowing air to pass over the weave. A hair dryer also works when drying a small spot. Do not clean the fringe with anything except clean water. Bleach changes its color and destroys the fibers. Vacuum with clean soft brushes and a clean bag.